ThemeParkMama: Wheat Thins Popped a Great Snack for Back to School! 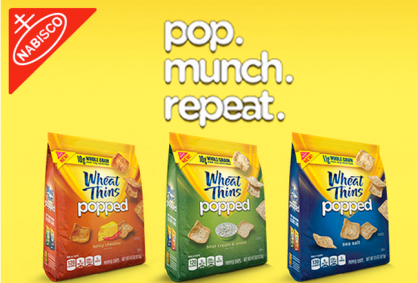 Wheat Thins Popped a Great Snack for Back to School! My kids love that the new size of the Wheat Thin Popped, they are huge like a saltine cracker. Since they come in flavors the kids all have a favorite, so its nice to mix it up for their snacks for school. You can pickup Wheat Thins Popped for about $3.69 a bag at your local grocery and major retail stores.